The FBI says it has finally arrested the North Texas man believed to be the "Mesh Mask Bandit." 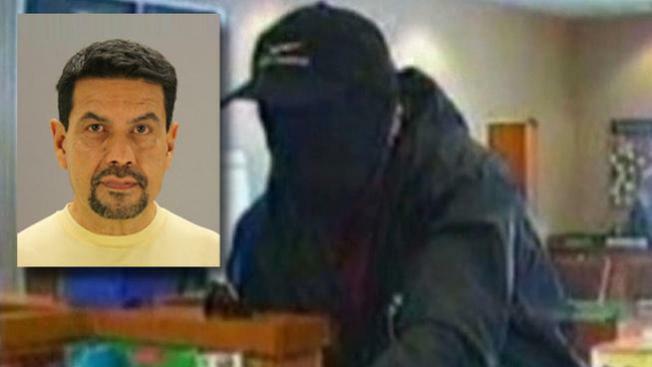 The FBI said Luis Delagarza, 59, of Farmers Branch, has been charged in a federal criminal complaint with committing armed bank robbery. Delagarza was once considered one of the most dynamic local leaders in the Latino community. "This was somebody that associated with some of the most important people in Dallas," said Carlos Quintanilla, Accion America president and longtime community activist. NBC 5's sister station Telemundo interviewed Delagarza several years ago about immigration reform. The FBI said a witness identified Delagarza from a photo lineup. According to the FBI's complaint and affidavit, the witness saw the face of the man who robbed a Wells Fargo Bank in the 13000 block of Josey Lane in Farmers Branch on April 22. The bank is blocks from Delagarza's home. The witness reported seeing the man's face both before he pulled on his dark mask and entered the bank with a handgun and after the robbery, when he removed the mask outside the bank. "The identification of the 'Mesh Mask Bandit' by the FBI's Bank Robbery Task Force was the result of collaborative local and federal investigation across nine cities," said Diego G. Rodriguez, Special Agent in Charge of the FBI Dallas Field Division. "The arrest of this dangerous individual illustrates the effectiveness of task forces, the support provided by the U.S. Attorney's Office and cooperation within the law enforcement community." The FBI had dubbed the bank robber the Mesh Mask Bandit because of his mesh mask that hid his face. The Mesh Mask Bandit was linked to robberies at 19 banks in North Texas since New Year's Eve. Bank customers said they are relieved an arrest has been made. "I'm glad they caught him," Brandon Vidal said. "It's a good thing. Put him away." Delagarza made his initial appearance in federal court Friday. A judge ordered that he remain in federal custody. He will be back in court on Tuesday. Delagarza was arrested twice before on charges of speeding and theft. FBI Works to Catch "Mesh Mask Bandit"
FBI Offers $15K Reward for "Mesh Mask Bandit"